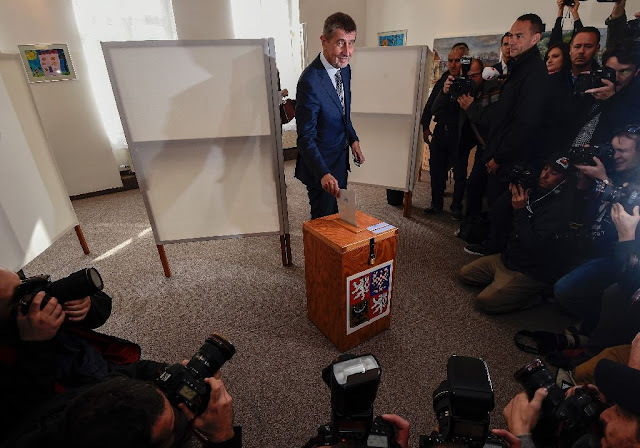 Czech billionaire Andrej Babis, chairman of the anti-migrant ANO movement, casts his ballot at a polling station near Prague in an election that could see the 'Czech Trump' take power. Prague - With voters upset over traditional parties and orders from Brussels, a billionaire populist dubbed the "Czech Trump" has taken a huge lead in the Czech Republic's election followed by an anti-EU and anti-Islam party with links to France's National Front. State election officials citing results from nearly 73 percent of polling stations said Babis's anti-corruption and anti-euro ANO (Yes) movement was ahead with 30.87 percent support with the far-right Freedom and Free Democracy (SPD) in second place on 11.19 percent. The eurosceptic right-wing ODS party has clinched third spot with 10.51 percent and the anti-establishment Pirates scored 10.04 percent. Despite the country's economic success, analysts say many Czechs who are heavily in debt or working long hours for low wages feel they have been left behind and are turning to populist parties to vent their ire. Far-right and far-left anti-EU parties made gains in a fragmented vote that appeared to put eight parties into the 200-seat Czech parliament with few natural coalition allies among them, something analysts warn could herald instability and even chaos. The Social Democrats (CSSD) who head the outgoing coalition government took a bruising, coming in sixth with 7.67 percent of the vote. Voting earlier on Saturday, outgoing Social Democrats (CSSD) Prime Minister Sobotka warned the election "will decide about our country's focus, whether we stay part of the EU and NATO, or whether extremist forces trying to drive us out of these structures will post gains." The far-right SPD of Tokyo-born entrepreneur Tomio Okamura made the strongest gains clinching second spot on strong anti-EU, anti-migrant and anti-Islam rhetoric, similar to surging far-right parties in neighbouring Austria and Germany. France's far-right National Front Marine Le Pen sent Okamura a message of support. "I see this as a threat to liberal democracy" in this EU member of 10.6 million people, Tomas Lebeda, a political analyst at Palacky University in the central city of Olomouc, told AFP. Voting in a Prague suburb, pensioner Zdenek Kraml favoured the left-wing Social Democrats, currently in a rocky centre-left coalition with Babis's ANO and the smaller centrist Christian Democrats. "In the four years since the last election, pensions have gone up, just like wages and welfare benefits," he told AFP. With joblessness at 3.8 percent in September, the Czech economy which is heavily reliant on car exports is slated to grow by a healthy 3.6 percent this year. But other voters did not conceal their disillusionment. Young Prague voter Jiri Chaloupek said he chose the SPD as "this country needs a change, a rather radical change." Analyst Lebeda said "we have a very strange atmosphere with a number of emotions that absolutely do not correspond to the social and economic reality." "I'm asking myself what the elections would look like if we weren't in such good shape economically." A 63-year-old Slovak-born chemicals, food and media tycoon, Babis said he expected the Czech Republic to "enter a new stage" after voting on Friday, adding it needed "a government which will really tackle people's problems. While the billionaire-politician has vowed to steer clear of the eurozone and echoes other eastern EU leaders who accuse Brussels of attempting to limit national sovereignty by imposing rules like migrant quotas, he favours a united Europe and balks at talk of a "Czexit". "I think his policy is for the people," pensioner Alena Kolarova said after voting in Prague and praised Babis for "restoring order in public finances and tax collection" during his three-year stint as finance minister that ended in May. Babis's main rival, Social Democrats leader and Foreign Minister Lubomir Zaoralek has said he hoped that the future government would ensure that the Czech Republic does not drift to the EU's periphery. Partial results showed the anti-EU Communists took fifth spot winning 8.51 percent support. With voters upset over traditional parties and orders from Brussels, a billionaire populist dubbed the "Czech Trump" has taken a huge lead in the Czech Republic's election followed by an anti-EU and anti-Islam party with links to France's National Front.